Have you ever felt your heart break? Is there a moment in your memory when anger made your hands subconsciously clench into balls of rage? Does seeing someone you desire make your knees weak or stomach flip? Scientists have known for decades that the central nervous system controls the body through the release of chemical messages. When the brain observes an event, its job is to make the body react accordingly, and to do so, sends ligands (a form of peptides) throughout the body. Specific body parts or systems have matching receptors to the chemical messages, enabling necessary reactions. One of the most primitive examples and emotions is fear. When the brain senses danger, it releases cortisol, adrenaline, and other hormones to make a person’s body run or rouse (“fight or flight”). This is a very basic function, but what happens in our brains and bodies to deal with emotions like love, contempt, envy, surprise, or even depression? Lauri Nummenmaa, a psychologist from Aalto University in Greater Helsinki, Finland, has discovered an amazing connection between human emotional responses and sensations in the body. Her team recruited 700 volunteers from Finland, Sweden, and Taiwan to participate in a computer experiment to self-report body sensations during episodes of emotion. The researchers gave each participant two blank silhouettes of a person. Next, the researchers told each participant to reflect on one of 14 emotions (anger, fear, neutral, happiness, anxiety, love, depression, disgust, sadness, surprise, contempt, pride, shame, and envy). Their job was to paint the two silhouettes in a manner that reflected their bodies’ reactions: one they painted the areas of stimulation (warm colors), and the other, the areas that are disengaged (cool colors). Although the artistic renditions of each participant varied from one another, striking similarities existed for each emotion. For example, love and depression demonstrated antagonistic responses; love gave people a warm sensation throughout their whole bodies, while depression left a complete void. Anger was a top-heavy emotion, filling up the head, chest, and arms (very few emotions had quite a reaction in the arms). Fear, not surprisingly, consumed the chest. People with depression, typically coupled with anxiety, have expressed feeling a pain in their chest. In fact, chest pain can be a chronic symptom of depression and anxiety. The body’s response to stress prompts the release of cortisol and other hormones to make a person react. Not every person with depression feels these symptoms, as was evident by the overall devoid sensation it gave the participants in the Aalto study, but fear could play a major role in depression and anxiety for many, causing a sensation in the chest. The findings of this study and the sensation maps can be found in the Proceedings of the National Academy of Sciences. 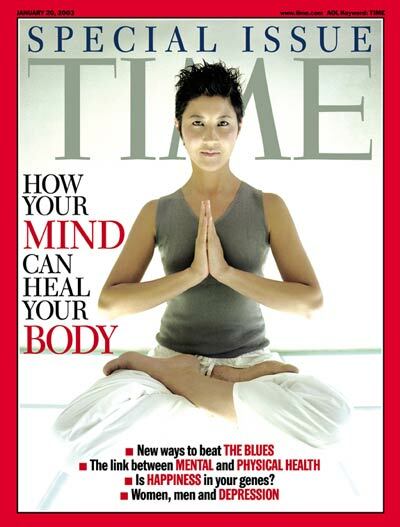 Researchers believe that humans can harness the knowledge of bodily sensations to improve mood (or sustain it). 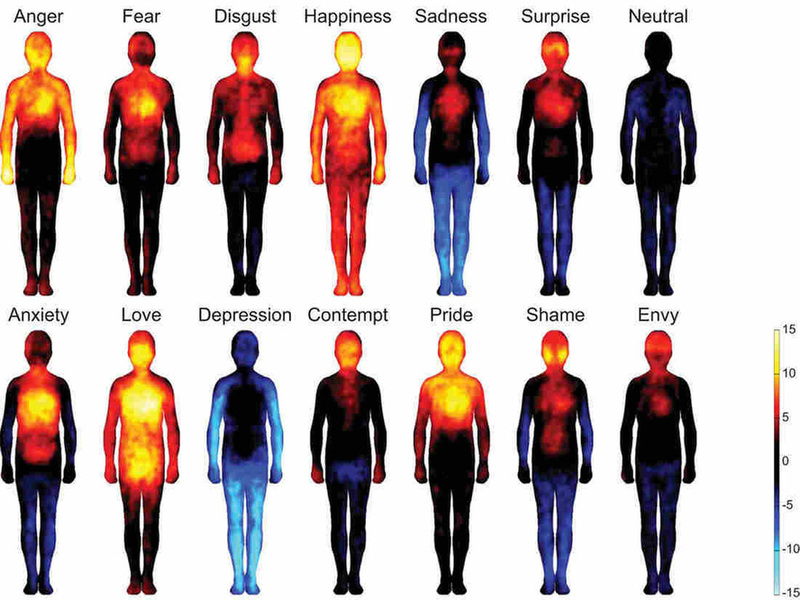 When a person can recognize a response in the body, he or she can connect that sensation to an emotion. Antonio Damasio explains it this way: “…emotions also have to do with how we deal with the environment—threats and opportunities”. If an event creates an emotion that provides us with a sensation correlative to depression, then we can work through our perception of that event or avoid it. In the same way, people can embrace circumstances by recognizing the sensations in the body that express a positive emotion. Body language can “alter your mind”, thus altering your mood. Amy Cuddy, a Harvard Business School professor and psychologist, makes a bold suggestion regarding body posture and stance, and its effects on mood. She asked people to take on either high-power or low-power poses for two minutes. High-power poses would be big, room-grabbing poses, like Wonder Woman or Superman. The CEO pose is also powerful—leaned back, legs on the desk, arms folded behind the head. Low-power poses exhibited giving power, becoming small, like some animals’ defensive mechanisms in the presence of larger animals. She then analyzed the hormone levels in the participants’ saliva pre- and post-pose, and found significant results. Power poses produce power! The mind will react to the body in the same way that the body reacts to the mind. People with negative issues, such as anxiety, depression, or fear can create physiological responses in their own bodies. Of course, these types of illnesses are serious, and not everyone can adjust their mood so easily, but with further research and utilization of these tools in therapy, people may realize their potential to take control of their body and mind.